Evolution is not the study of life’s ultimate origin as a path toward discerning its deepest meaning. Evolution, in fact, is not the study of origins at all. Even the more restricted (and scientifically permissible) question of life’s origin on our earth lies outside its domain. (This interesting problem, I suspect, falls primarily within the purview of chemistry and the physics of self-organizing systems.) Evolution studies the pathways and mechanisms of organic change following the origin of life. The when and what and the how of hereditary changes, for example the theropods (suborder Theropoda, from Greek, meaning “beast feet,” a broad category encompassing all bipedal-running carnivores like T. Rex and Velociraptor) or… more specifically, maniraptoran (“thieving/snatching hands” or “raptor hand”) dinosaurs becoming birds, these are the study of evolution’s main points of inquiry. My questions are: why did some landlocked dinosaurs evolve feathers, while their airborne cousins, the pterosaurs—the first flying vertebrates—did not? Why would flightless bipedal predators like Deinonychus and Microraptor (and their other raptor descendants) develop feathers instead of pterosaur-style fur-like pycnofibre coats? 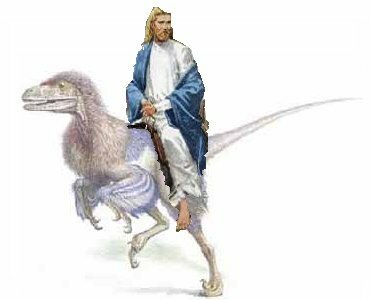 Basically, what is the evolutionary advantage of feathers vs. pycnofibres if you’re a theropod? First, the issue of maniraptoriforme dinosaurs (trying to use a broad category for all the raptory dinos close to birds, though it is likely I’m using the wrong one). Yale paleontologist John Ostrom unearthed Deinonychus from Montana in 1964, and though Deinonychus wasn’t the first raptor described, Ostrom’s detailed monograph on the specimen (published in 1968) provided the clearest evidence yet that bird-like theropods existed, and shed new light on dinosaurs. Deinonychus was obviously built for speed and speedily tearing prey, their scary claws inspired the Greek name Deinonychus (“terrible claw”), and, along with their big brains and eyes, did not match up with the prevailing view of dinosaurs as fairly slow, cold-blooded cousins of crocodiles. What I call the warm-blooded birdosaur theory, proposed by Thomas Henry Huxley in 1868 along with his observations about Archaeopteryx (the small, bird-like dino “transitional species” found in 1861, “intermediate between birds and reptiles”), was revived thanks to Ostrom’s work. His work on the similarities between Deinonychus and Archaeopteryx put the theory on such solid ground, few try to disprove that “some dinosaurs were warm-blooded.” And subsequent discoveries established it so well, warm-bloodedness is hardly doubted nowadays even in lumbering herbivores like Stegosaurus Stenops. Quetzalcoatlus was an enormous pterosaur that would’ve been roughly eye-to-eye with modern-day giraffes. Art by pterosaur expert Mark Witton. Explanation of the mass estimate for Quetzalcoatlus on his flickr. of biological possibility for an ectothermic (cold-blooded) creature with the limitations of a reptilian circulatory and respiratory system, but could be possible (though still “redonkulous”) with a powerful, avian-type of cardiopulmonary system. Likewise, understanding how pterosaurs vaulted themselves into the air and then sustained the movements of powered flight for extended periods is near-impossible assuming ectothermic metabolisms, especially considering the biggest, giraffe-sized pterosaur species, but begin to make sense for an endothermic creature. When I say “subsequent discoveries” confirmed the birdosaur theory, I’m referring to the series of fossil “transitional species,”or more informally, “dino-birds,” that have been found in the late ’90s and throughout the ’00s up through today, mostly in China and environs. A surprising number of these seriously freaky-deaky species, Archaeopteryx-like “dino-birds,” have been identified and studied in recent years. Insofar as a species can be freaky-deaky, these “dino-birds” are… though in my opinion, plenty of existing species fall into the freaky category: turkeys, vultures and ostriches from the birdosaur lineage, bats who arrived at scary, pterosaur-like wings independently, etc. But I guess if you’re a member of one of the aforementioned species, you don’t seem so freaky. First described in 2011, Xiaotingia zhengi is the closest relative of Archaeopteryx found so far, and one of the basalmost (earliest, most “basal,” preferred over the term “most primitive” since later stages of evolution aren’t necessarily “better”) “transitional species” identified to date, more basal than Archaeopteryx. Like Archaeopteryx itself, the phylogenetic categorization is murky indeed: it’s debatable whether Xiaotingia counts as a straight-up bird (“early avian species”) or an “intermediate species” (dino-bird) somewhere amongst the roots of what became the bird family tree (the class Aves). Its dino characteristics exist mostly in certain non-avian skeletal features, not in visible form (excepting the long, bony, maniraptoriforme tail). Graciliraptor, a freaky-deaky birdosaur from the early Cretaceous, is one of the more basal (primitive but you’re not supposed to use “primitive”) dino-birds, with much more dino-y characteristics. Described in 2004, Graciliraptor is considered closely related to freaky four-winged dino-bird Microraptor, so it’s considered a microraptorian, an even more narrow category than Maniraptoriformes, that includes the smallest, closest dino relatives of birds. at 1.6m, Tianyuraptor is the largest known microraptnrian. Tianyuraptor. Really bizarre and amazing dino-chicken Tianyuraptor ostromi (named in honor of John Ostrom). This “life restoration” of Velociraptor mongoliensis is largely representative of the current consensus on what most “raptor” species were like: feathered birdosaurs. Current Toronto Raptors logo, still more tyrannosaur-like than today’s conception of raptors as feathered and bird-like. and rendering Spielberg’s scaly Jurassic Park velociraptors (and NBA team Toronto Raptors‘ velociraptor logo) inaccurate. Why would some theropods, landlocked carnivores in an environment of ferocious dino-eat-dino competition, evolve feathers? Why would the development of feathers make the evolutionary to-do-list for these predatory dinosaurs who needed to devote all the biological resources they could accrue to gain an edge in the game of kill-or-be-killed? This is especially puzzling when one considers pterosaurs’ featherless physique; now that we know more about pterosaur evolution, it’s clear that their fuzzy, partial pycnofibre coats weren’t helpful for flying and bore no resemblance to proto-feather layers. We can conclude the weird partial coats of pycnofibres (which kind of remind me of humans’ internal cilia) were sufficient for pterosaurs’ thermoregulatory needs and feathers weren’t crucial to being a flying predator. Additionally, pterosaur evolution was so radically different from all other archosaurs, they must’ve split from the herd very early in their development. John Ostrom’s crowning achievement, Deinonychus, depicted as a big feathered raptor here in the traveling exhibit “Feathered Dinosaurs and the Origin of Flight,” Germany, February 2009.
wouldn’t’ve invested evolutionary/mutagenic energies into feathers unless out of necessity, so I tend to view their feathering-up as a thermoregulatory aid, essential for smaller species (microraptorians for example) that are especially vulnerable to heat loss. Eventually, climate swings into colder temperatures may have wiped out featherless theropods while feathered species survived, or perhaps a time period of the only sustainable sources of prey being in cold parts of Earth disadvantaged featherless predators, or something far more complicated, but somehow feathers gave enough benefit that they continue in the gene pool from at least the Late Jurassic to today. …so small, active endotherms would be expected to insulate their bodies to reduce heat loss. Small theropod dinosaurs, therefore, evolved insulation to prevent heat loss because they were endotherms -not because they ‘wanted’ to become birds! Liaoning discoveries indicate that various types of insulatory covering developed, most probably by subtle modifications to the growth patterns of normal skin scales; these ranged from hair-like filaments to full-blown feathers. It may well be that genuinely bird-like flight feathers did not evolve for the purposes of flight, but had a far more prosaic origin. Several of the ‘dinobirds’ from Liaoning seem to have tufts of feathers on the end of the tail (rather like a geisha’s fan) and fringes of feathers along the arms, on the head, or running down the spine. Clearly preservational biases may also play a part in how and on which parts of the body these may be preserved. But for the present, it seems at least possible that feathers evolved as structures linked to the behaviour of these animals: providing recognition signals, perhaps, as in living birds, or being used as part of their mating rituals, long before any genuine flight function had developed. In this context, gliding and flight, rather than being the sine qua non of avian origins, become later, ‘add-on’ benefits. Obviously, feathers have the potential for aerodynamic uses; just as with modern birds, the ability to jump and flutter may well have embellished ‘dinobird’ mating displays. For example, in the case of the small creature Microraptor, a combination of fringes of feathers along the arms, legs, and tail would have provided it with the ability to launch itself into the air from branches or equivalent vantage points. From just this sort of starting point, gliding and true flapping flight seem a comparatively short ‘step’ indeed. It’s kind of romantic if you think about it, devoting millions of years in order to move from carpet-esque proto-feather fuzz to a covering with more “bling,” to impress a mate. It also underscores how features often evolve in animals in indirect and unexpected ways. In another unexpected quirk of evolution, the dating of dino-bird specimens, even basal “intermediate species” like Xiaotingia, and oldest, basal microraptorians like Sinornithosaurus, shows they were around after, and coexisted with early avians. That freaky dino-birds like Sinornithosaurus rubbed elbows with ducks, ostriches, quail, turkeys, etc. means birds “spun-off” from an earlier common ancestor, likely an even more basal microraptorian during the Jurassic period. Think of Aves (the class containing all of today’s birds) as a TV show spin-off, but a spin-off that lasts much longer than the older show it branched-off from, like The Simpsons, which was originally a segment on The Tracey Ullman Show, was spun-off as its own series, coexisted on the TV schedule with The Tracey Ullman Show for multiple seasons but ultimately outlived its ancestor and keeps going and going up to today. Similarly, Aves spun-off from the dino-bird show, coexisted on the Mesozoic schedule, living side-by-side throughout the Cretaceous, but the dino-bird show got canceled via the big, horrendous kablooie, the Cretaceous-Paleogene extinction event, and along with an estimated three-quarters of plant and animal species on the planet, didn’t live to see the Cenozoic (the consensus is still that something bad collided with the Earth). Somehow, Aves kept going and going, with nearly all its cast intact. Note: I wanted to add the infamous Alabama State Board of Education “biology textbook insert” evolution disclaimer at the top of this post, but it is too long. The revised disclaimer seems 30-40% longer than than the original 1996 sticker I confronted in high school, though it’s still written in the same clunky, dense committee-ese that proved indecipherable for even the most bold, intrepid minds back then, so is skipped so thoroughly that few students could tell you it’s there. Read the 2001 “biology textbook insert” here if you’re in need of an insomnia cure. I heard on NPR’s TED Radio Hour in an offhand comment in the first segment of a November episode called Misconceptions, that the brontosaurus name is no more, and that kids today learn that it’s an apatosaurus (older name, same dinosaur). Taken aback, I searched for the explanation… how could the brontosaurus name (meaning “thunder lizard”) be discarded in favor of apatosaurus (meaning “deceptive lizard”)??? Your average brontosaur—a median example, not the biggest—was roughly the weight of four bull elephants, and one individual’s thunderous stomp would have been about as “deceptive” as a gigantism-affected pachyderm herd stampeding x 50, i.e., not sneaky or deceptive at all. More convincing were some tracks observed by Bird at Davenport Ranch, also in Texas. Here he was able to log the tracks of 23 brontosaur-like sauropods walking in the same direction at the same time. This suggested very strongly that some dinosaurs moved around in herds. Herding or gregarious behaviour is impossible to deduce from skeletons, but tracks provide direct evidence. If herds of such enormous creatures trampled over areas, as they certainly did at Davenport Ranch, then they also had the capacity to greatly disturb the earth beneath – pounding it up and destroying its normal sedimentary structure. This relatively recently recognized phenomenon has been named ‘dinoturbation’. … Great herds of multitonne dinosaurs moving across a landscape had the potential to utterly devastate the local ecology. We are aware that elephants today are capable of causing considerable damage to the African savannah because of the way that they can tear up and knock down mature trees. What might a herd of 40-tonne brontosaurs have done? So, yeah. Just imagine it, the extreme damage a herd of brontosaurs could do, “dinoturbation” of the landscape still obvious from the Jurassic Era, 208-144 million years ago (and it makes sense that brontosaurs, unarmored, gigantic prey animals without many defensive adaptations, would travel in herds for strength in numbers). What might a brontosaurus herd sound like?? Thunder, rolling thunder, louder than anything. Thunder lizard (brontosaurus) is clearly the right name. Alas, the apatosaurus name won out, as noted by an NPR News piece just a year ago: Forget Extinct: The Brontosaurus Never Even Existed : NPR – All Things Considered (i.e. 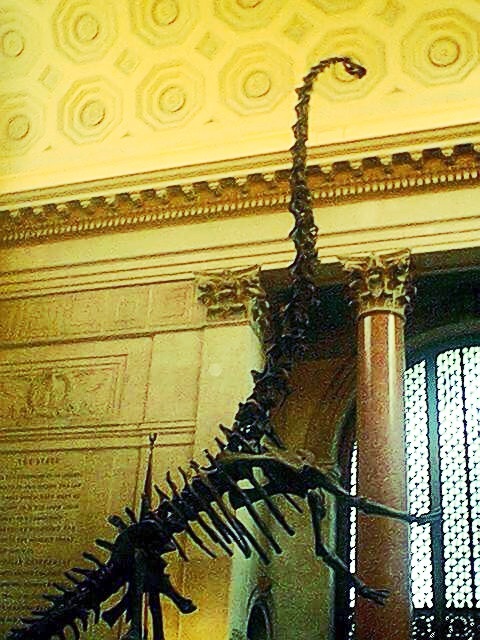 it didn’t exist because it’s apatosaurus and was acknowledged as such in 1903). Take a little deception, add a little excitement, stir them with a century-long mistake, and you have the mystery of the brontosaurus. Specifically, you have the mystery of its name. For 100 years this 70-foot-long, 30-ton vegetarian giant had two names. This case of double identity began in 1877, when bones of a large dinosaur were discovered. The creature was dubbed apatosaurus, a name that meant “deceptive lizard” or “unreal lizard.” Two years later, bones of a larger dinosaur were found, and in all the excitement, scientists named it brontosaurus or “thunder lizard.” This name stuck until scientists decided it was all a mistake—the two sets of bones actually belonged to the same type of dinosaur. Since it is a rule in taxonomy that the first name given to a newly discovered organism is the one that must be used, scientists have had to use the term apatosaurus. But “thunder lizard” had found a lot of popular appeal, and many people still prefer to call the beast brontosaurus. According to the brontosaurus information at the American Museum of Natural History, when paleontologist Elmer Riggs (Field Museum of Natural History, Chicago) published his study in 1903 showing the apatosaurus found was actually a juvenile example of the genus, not separate from brontosaurus, it technically ended the matter, “officially” the apatosaurus name took precedent from 1903 onwards. But there had to be more to it. I still learned about “thunder lizards” in elementary school. Amidst the late ’80s-early ’90s “dino-mania” brontosaurs were widely seen (and labeled brontosaurus), so when and how did apatosaurus displace the brontosaurus name? 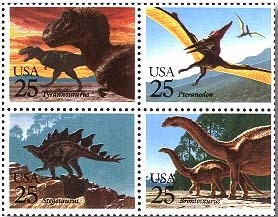 These postage stamps were great; I was more inclined to mail letters when they could be stegosaur-stamped letters. But the Postal Service got a mass of Comic Book Guy-type complaint letters demanding retraction of the brontosaurus name in favor of the apatosaurus name, and the media who had covered the release of the dino stamps since it was one of the first times USPS issued special stamps (unveiled at Disney World the year me/my family were there), got similar complaint letters. Soon, apatosaurus was widely known as the “correct” and “scientific” name. Touché and right on; no one bitched about Pteranodon, and that’s a real error. The Post Office has been more right than the complainers, for Uncle Sam has worked in the spirit of the plenary powers rule. Names fixed in popular usage may be validated even if older designations have technical priority. But now…Oh Lord, why didn’t I see it before! Now I suddenly grasp the secret thread behind this overt debate! It’s a plot, a dastardly plot sponsored by the apatophiles–that covert society long dedicated to gaining support for Marsh’s original name against a potential appeal to the plenary powers. They never had a prayer before. Whatever noise they made, whatever assassinations they attempted, they could never get anyone to pay attention, never disturb the tranquillity and general acceptance of Brontosaurus. But now that the Post Office has officially adopted Brontosaurus, they have found their opening. Now enough people know about Apatosaurus for the first time. Now an appeal to the plenary powers would not lead to the validation of Brontosaurus, for Apatosaurus has gained precious currency. They have won; we brontophiles have been defeated. According to the ICZN Code, the first designated name for the species reigns, but the Zoological Congress of 1913 in Monaco added the plenary powers rule, an appeal process whereby applications to “suppress” the oldest name, if the current name is better and more well-known, could be reviewed. Gould describes the 1913 adoption of the plenary powers rule as a response to what I’d call griefers (a term from the world of massively multiplayer online games—MMOs—meaning someone whose primary means of enjoyment is the intentional griefing, verb: present participle, of other players, the ruining of others’ fun). In “Bully for Brontosaurus,” Stephen Jay Gould cities Dinny the dinosaur as an example of brontosaurs in popular culture. 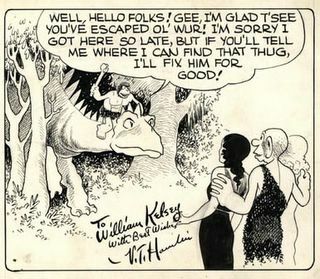 Dinny is Alley Oop’s trusty brontosaurus-like companion and transportation, in the newspaper comic strip Alley Oop (1932-present). Some were using the ICZN oldest-name-gets-priority-rule just to derive pleasure from the panic and discomfort wreaked on the Zoological Congress when a well-established name was apt to get toppled; Gould describes an attempt to replace the name boa constrictor with an unknown obscurity that was ultimately suppressed using the plenary powers rule. The plenary powers rule seemed to set the table for brontophiles to appeal the apatosaurus name. After all, the brontosaurus was everywhere, probably second only to the T. Rex in cultural ubiquity, commonly seen in comic books, comic strips (Alley Oop), cartoon shows and movies, The Flintstones, even as the mascot and logo of Sinclair Oil, and in U.S.-written animated shows, it was akin to visual shorthand for “Jurassic Era” or “dinosaur.” The brontosaurus is the dinosaur, what people picture when the word “dinosaur” is mentioned. As dino-mania really took hold, Was (not was) had a big hit in 1987 (UK) and 1989 (US) with “Walk the Dinosaur,” which featured a dance in the music video, “the dinosaur,” done with forward motions of the hand/wrist to mimic a brontosaur’s neck, the most recognizable neck of all Dinosauria. Brontosaurus, even on the record cover of the “Walk the Dinosaur” single [1987, Chrysalis Records]. like The Twist or The Hustle (but the dinosaur dance never caught on that much beyond the cave-girls in the music video) originally it wasn’t a dance song. MTV and near-mandatory music videos for singles changed everything: prior to the music video with cave-girls and dinosaur dance—complete with “follow the dancing ball” caption-instructions to teach you the three steps to the “do the dinosaur” dance—“do the dinosaur” was a reference to the extinction of humanity via global thermonuclear war, the “Boom! Boom! Aka-lacka-boom-boom!” was the bombs falling to start armageddon. Aside from the fictitious dorsal armor-spikes (and human rider), Dinny the dinosaur is actually a fairly accurate rendering of a brontosaurus. His head, longish and pointy, is more correct than many other early depictions, which often incorporate paleontologist O. C. Marsh’s placement of the much blockier Camarasaurus skull onto early skeleton displays of the species. an incredible, 500-liter, mega-efficient, four-chambered bird-type heart, avian-esque but on a massive, big, big scale that is hard to fathom. With a reptilian circulatory system it really would be impossible. Such an outlandish creature is hard to forget. Its image has real staying power. And it provides us a reminder of how beautiful and weird the natural world can be, how it tends to zigzag while our expectations go straight. As for the brontosaurus name, it wouldn’t win an appeal to the plenary powers since the postage stamp kerfuffle (though it totally would have won such an appeal in 1965, 1975, even 1985) but we can still use the name. “Brontosaurus” (thunder lizard) is the more appropriate name and, as a slightly newer (1879) synonym, shouldn’t be seen as incorrect, no matter what they say. The best thing we brontophiles can do is keep the name in circulation on the internet, refer to brontosaurus in posts and comments whenever possible (and whenever impossible is fun too). Keep saying “brontosaurus” to keep it alive: brontosaurus, brontosaurus, brontosaurus. UPDATE: Apparently the Top Search term leading people to my blog is still “griffin.” If you’re one of the griffin-seekers, Welcome! feel free to browse, there are lots of posts here, lots of history essays, on everything from Chinese history to the weird story of top-hat gangsters taking over 1850s Baltimore. Without further ado, here is my June 25, 2007 post on the history of the griffin and its potential dinosaur origin story! I saw this thing on the History Channel the other day about the origins of mythic creatures. Scythians spread the legend of the Griffin, and Griffin stories quickly spread to Greece and throughout the ancient world, even to the Jews. The Torah says don’t eat griffins (always good advice). The “New Testament” uses a griffin as a metaphor for Jesus or something. 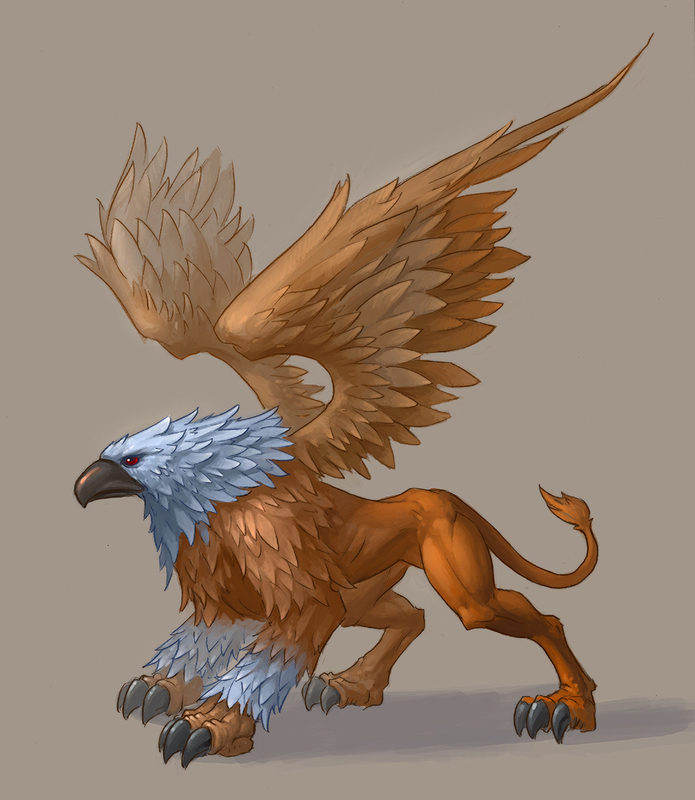 The Scythians would use the Griffin to scare off enemies, letting it be known that their treasure is guarded by a Griffin and if you invade, the Griffin will eat you, etc. An ingenious defense strategy, and evidence has been mounting that the steppe horsemen-warrior cultures (Scythians, Mongols, etc) had griffin encounters for real, it’s just that the griffins seen were very complete Protoceratops fossils. Griffins were really dinosaurs. Griffin-looking dinosaur skulls (pictured here) have been laying around in the heart of what was Scythian territory. 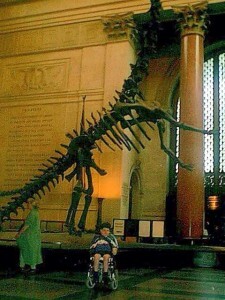 Read more about this at the American Museum of Natural History: Griffin Bones. The Scythians would have seen these skulls and, understandably, assumed beasts of this nature were nearby, or maybe just thought it was great propaganda material to scare enemies. And new discoveries are happening every day. I’ve elevated this post to part 1 of 4 in my D-cember: Dino-cember! series.